You know you need to go to the Volcano National Park. That’s what people do because there is no other active volcano they will probably ever visit. Although I agree you need to go there, the trick is realizing quickly there is little to do there and moving on better activities. We’ll save this activity for early evening. If you are in Kona you will travel over Saddle Road or drive a bit North through Weimea. Saddle Road is 1:30 hours instead of 2:00 hours through Weimea. However, the drive through Weimea is nicer, down the Hamakua Coast. Your choice. 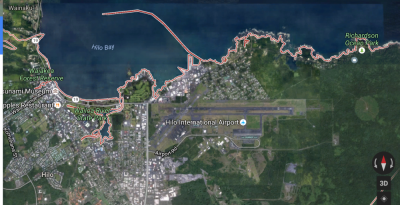 Either way you will end up on Hilo Bay. Need Breakfast or Lunch? Go to Kens House of Pancakes on the corner of Kamehameha Ave. and Highway 11. Order a Moco Loco. That’s Hawaiian comfort food that is uniquely Hawaiian. You are on Hilo Bay. Go across the street on Banyan Drive and pass the horrible looking hotels that look abandoned. When you see a collection of ponds and a Japanese Bridge you are at Liliuokalani Park & Gardens. There is a bridge over to a small “island.” That is Coconut Island. Spend half an hour here unless you decide to get that great picture of you jumping off the rocks into the ocean on Coconut Island. In front of the golf course on the main road (Kamahamaha Ave.) is an antique clock that is no longer tells time. It is a small monument of the 1946 tsunami that killed 100s in Hilo. Next destination is Rainbow Falls and Boiling Pots a few miles away. Go North on Kamahamaha Ave. a mile until you are just about to leave town and turn left on Kauman Drive. Go inland about a half mile until Waianuenue Avenue. Veer to the right and look for the Rainbow Falls sign. A beautiful waterfall and river depending on the amount of recent rainfall. You can walk around the beautiful area but don’t spend too much time here. Next drive a half mile farther up Waianuenue Avenue and look for the Rainbow Falls sign and park. Here you should ignore the fact there is a railing and climb down the trail to the water, using care of course. If you don’t have a picture yet of you waving under a waterfall, here is your chance. The water is a bit cold, but you will always smile passing the picture on your wall. Drive back down to the bay. Your next stop is Hawaii Tropical Botanical Gardens. It is only a 10 minute drive to the best tropical gardens on the island. You came to this side of the Big Island for the lush beauty, and you found it here. Spend an hour here. Next, drive back to Hilo and across the bayfront back to Ken’s. If you are hungry for lunch, instead of driving across the Bayfront drive back a couple blocks up via Kilauea Street until you reach Café 100. It is a quick lunch of traditional Hawaiian food for a great price. Your next visit will be Richardson’s Beach Park, south Hilo bay. If you want to enjoy the best snorkeling you may ever experience, here is your chance. If you don’t have snorkel gear, no problem. You can get a decent mask at Walmart for $10. If snorkeling isn’t for you, a visit to this beach park is still a must. For snorkeling gear, go to Walmart just above the Hilo Airport. Turn left on Makaala Street. Finding Richardson’s Beach Park is easy. Back on the road, continue down Hwy. 11 until it ends back at Ken’s. Turn right and it will immediately veer left and become Kalanianaole Avenue. Notice Ponds restaurant. Drive 3.5 miles and Richardson’s Beach Park will be on your left. Park and walk toward the house that resides there. You will notice a black sand beach. The area is beautiful. If you decide to snorkel, enter the water at the farther black sand beach. The water is warmer. Swim out toward the rocks out in the ocean. The water is shallow and the fish abundant. Green Sea turtles are very popular. Chances are you will see one. If you want to see turtles come to rest for the night, arrive back at sunset and walk over the rocks beyond the black sand beach. Turtles come to rest for the night in the canal of water between the rocks. Next will be the 40 minute drive to Volcano National Park, with a few optional stops depending on your timing. You will want to visit Volcano National Park an hour before sundown to see the glow of the lava deep in the caldera. Continue to Mamalahoa Hwy., also knows as Highway 11 (where Kens and the airport are on). This takes you all the way up to Volcano National Park. As you pass the airport and mall (Walmart) you have a choice to see the Kaumana Caves. It is a lava tube that is better than the Thurston lava tube in Volcano National Park. Simply turn right above the mall on highway 2000. It is only a mile off this street. If you see the tube now, you can skip Thurston, especially if you arrive too late to visit the tube after arriving at the Park. Just over 4 miles up you will see a turn off for the Hilo Zoo. It depends on the amount of time you have and if you have kids who want to see a zoo. Another ½ mile up you will see on the other side of the road an entrance for Mauna Loa Nut factory. Just a “look through the window” type of tour and a gift shop. Both of these activities are free, so even a 20 minute stop at each is an alternative. We saved both of these for a two day visit. If you have time for a stop for afternoon coffee, 10 minutes farther up the road is a town called Mountain View. Keep an eye out on your left for Hilo Coffee Mill. Stop by for a quant coffee shop with a garden some animals and a peek at the coffee mill. It is a quick stop. When you approach the Volcano National Park gate you have a choice. Since there isn’t much to do at the park, there isn’t a reason to arrive sober. If you want a bite to eat go just a mile or so farther to the Volcano Winery and get a cracker and cheese spread. Get the very reasonably priced wine and cracker/cheese package. A quick visit will do so tell them to keep the samples coming. If you are interested in the vineyard they give little tours. It is a beautiful area. Now go back and through the gate, paying your fee. What is there to do? Go in the visitor’s center and watch the little movie and the other displays. They give little walking tours but they simply describe some local plants. After the visitor’s center, drive a mile down to the sulfur steam vents. This is your highlight sadly enough. The vents emit steam from rain coming in contact with the hot rocks below. Pretty cool. You also look down into the Kilauea crater. You see gases raising up from the lava lake. The problem is that the lake stays about 150 feet below. At night you see a glow, but a faint one. That’s it. On the other side of the road is a ¾ mile trail of more vents and sulfur deposits. It’s ok if you can walk quickly. After this you can go 5 miles farther down Crater Rim Drive to the Jagger building. It is a building a little closer to the lava lake, but otherwise it offers nothing different. This is why you want to be at the Jagger museum well after sunset – to see the orange glow of the lava lake from here. Exiting the Jagger museum, the road is closed beyone this point. Driving back to the gate you veer right to go to the Thursen Lava tube. It is only a couple miles of beautiful road so this is a must. Park as best as possible and go down the steps to the tube. It is a short, well lit tube. You then climb the stairs back to your car. If you continue the drive you will end up near the ocean until the road stops. You then have to drive all the way back up. No time for this. That is all there is to do unless you enjoy hiking rocky, barren trails. About 5 miles down the road you will see Akatsuka Orchid Gardens.. Make this a 10 minute stop, if at all. The orchids are expensive and nothing you can’t buy at home. They just started charging to walk around the store where growing orchids are sitting. It’s a silly tourist trap. Ready for dinner? Drive back to Ponds. The food is excellent and you views of the water around the restaurant with the Koi are great. Another great place in Pinapples in downtown. Pineapples doesn’t have views, but it has a younger crown and usually live music.